John William Polidori - creator of the literary vampyre! The novella entitled, The Vampyre - A Tale, was published in 1819 and caused a sensation in England and across Europe by virtue of its complete transformation of the old Eastern legends. It shocked readers by telling them of a vampire that socialised in the ballrooms of Georgian London and chose its victim from among the young lady debutants! The vampire mythology up until this novella was published was all about hideous animated corpses rising from the grave to torment their close relatives. The author of this novella was a young, handsome Anglo-Italian, John William Polidori, M.D. (Medical Doctor) (born 1795 died 1821). The novella was wildly successful and readers believed it to be a true tale! The novella's influence continues in the present age with its depiction of the evil Lord Ruthven resonnating in tv vampire series and on the movie screens. Franklin Charles Bishop spent a decade researching and revealing many letters and documents relating to Polidori and his creation of this stunning novella and the result is his book entitled, 'The Vampyre and other writings of John William Polidori' published by Fyfield Press with the aid of The Arts Council. 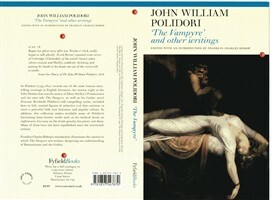 The book received a favourable review in The Times Literary Supplement and is regarded as the standard reference work regarding John William Polidori and his literary works. The book contains letters previously unpublished and untranslated and offers a fascinating and essential ground breaking work that illuminates the origins of the now familiar vampiric figure still very much to the fore in literature, tv, theatre and movies. Polidori was, of course, Byron's doctor - the only slim connection he had with Nottinghamshire. Neither Byron nor Shelley could stand him and he was effectively sacked in Geneva, walking across the Alps to Italy where (unsurprisingly) he was much happier. The Vampyre sold well as long as people thought the anonymously-published book was by Byron, though sales fell off abruptly when its true authorship became known. 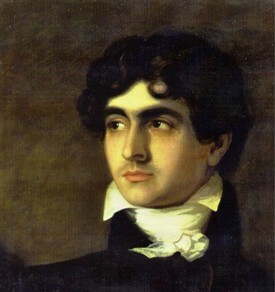 Polidori was also the uncle of Christina and Dante Gabriel Rossetti, though he took his own life long before those much greater writers were born. Mary Shelley used his name, mockingly altered by the Monster to 'Polly-dolly', in a rather better, longer-lasting horror story that she published around the same time. The fact is that The Vampyre; A Tale remains the most widely read novella of the Romantic period alongside Mary Shelley's Frankenstein. The disparaging remarks about Polidori wreak of obessive Byronism. Who reads anything of Byron nowadays except dull academics still desperately trying to justify or obliterate his disgusting private life? The fact remains that Polidori wrote the seminal vampyre tale which completely and utterly transformed the genre and still impacts today on the many vampire tv shows, movies, books etc. The Vampyre is certainly not 'the most widely read novella of the Romantic period'. It is not even the most widely-read horror story of the time, since the works of Peacock, Craik, Mrs Radcliffe, O'Banion, etc. remain much better-known. There is also a much more famous (late Victorian, 1897) vampire novel by Bram Stoker. We may well agree with the Monster in Frankenstein, or the Modern Prometheus when he laments 'Poor Polly-Dolly! Poor Old Polly-Dolly!' (p.264, 1819 edition, John Murray, Albemarle Street). I am very curious -- does anyone know who the gray-haired gentleman is in the image of the portrait above? I am curious owing to the oddest of reasons. I have an old oil on board portrait of Lord Byron, I doubt from an original sitting, but it has an unusual quality about it -- occasionally Byron's face seems to disappear and the face of a gray-haired gentleman appears in its place! 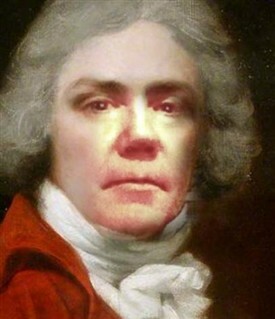 So, if anyone may know the identity of the gray-haired subject, please reply. I thought it may be Polodori, but he died very young and this gentleman has an older appearance.